As state officials rush to announce tax cuts, a former mayor now in the Senate is pleading for a little restraint and a return to pay-as-you-go government. Cutting taxes is a lot more satisfying than catching up on deferred maintenance and pension liabilities, which is why the state Senate is working on property tax reductions this week. So what’s with Kevin Eltife? As he did when he was mayor of Tyler and has continued to do during his decade in the Senate, the Republican is messing with the tax cutters and suggesting that because the state is unusually flush, this might be a good time to pay off some debt and take care of deferred maintenance and the like. His list includes new and existing roads, new and existing government buildings, and the state’s pension liabilities. He tried this in 2013 and is back for more. And he is not alone. At a Senate Finance Committee hearing on Monday, he was joined by a handful of others — Democrats and Republicans. If that sounds odd, you are not crazy. What looks like a property tax cut to a normal Texan registers as spending by the state government. And that matters, because every dollar of property tax relief is a dollar that can’t be used for something else unless lawmakers vote to exceed their own limit on how much the state’s budget can grow. “It is ridiculous that tax relief counts against the spending cap,” Finance Committee Chairwoman Jane Nelson, R-Flower Mound, said during the committee hearing. But tax cuts are what voters want, according to legislators just coming off of a year of answering to those voters in elections. It showed up as a popular idea in the latest University of Texas/Texas Tribune Poll, too: 54 percent of the state’s voters are dissatisfied with the amount of property taxes they pay. “Lower property taxes” ranked fifth on the voters’ list of priorities for the state Legislature, and it didn’t much matter which group of voters were asked: Republicans and Democrats alike are unhappy. Message received, apparently. “Elections have consequences,” state Sen. Paul Bettencourt, R-Houston, said Monday during a Finance Committee meeting, where tax cuts and tax limits were the item du jour. Lawmakers have proposed bills that would lower the business margins tax, increase the size of your homestead exemption on property taxes and limit the ability of local school districts, cities, counties and other governments to increase property taxes without voter approval. This is a peculiar time in Texas: The state government has more money than its lawmakers are willing to spend. Political respect for a constitutional cap on growth of the state budget is high, as is the appetite for property tax cuts — especially among Republicans. 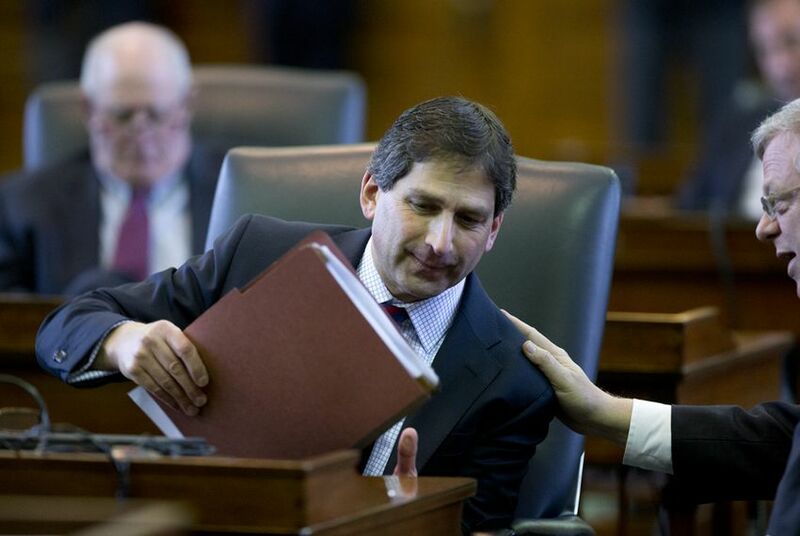 Tax cut fever is spreading rapidly, but Eltife wants to make the case for catching up with the state’s loose financial ends now and cutting taxes — if there is money left— after that. “When you’re in the chips, when you’ve got the cash — that’s when you can take care of these problems,” he said. It’s not just roads. The list of state property that’s just been let go is growing. As the Tribune’s Jay Root and Neena Satija have reported, it would cost about $1 billion to catch up on the state’s deferred maintenance. New statewide officeholders — conservative Republicans who are stingy with taxpayer dollars — have complained of leaky roofs, holes in bathroom walls plugged with toilet paper, bats biting employees in state buildings, and fire safety problems so bad the Texas School for the Deaf had to hire people to patrol in lieu of an alarm system. He wants the meat and potatoes before dessert. Most of his colleagues, however, have their eyes on the pies. Aman Batheja contributed reporting to this analysis.